Why is mid or medium term volatility defined as being 4 to 7 months out? 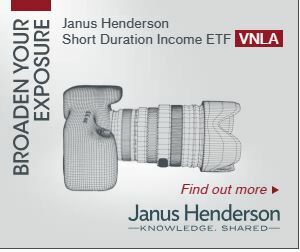 In January 2009 Barclays introduced VXZ, the first medium term volatility Exchange Traded Product (ETP). Its tracking index (SPVXMP) relies on 4 to 7 month VIX futures. I suspect that range was selected because historically (2004 through 2008) the term structure on the 4th through 7th month VIX futures was relatively flat but still tracked general volatility trends. By using the 4 to 7 month range Barclays could minimize transactions costs by holding futures for a full 3 months when it came to implementing VXZ’s hedging strategies. How does the mid-term rolling volatility index(SPVXMP) work? At the end of every trading day the index models the selling of a portion of the 4-month futures that it holds and uses the proceeds to buy an equivalent dollar amount of 7 month futures. 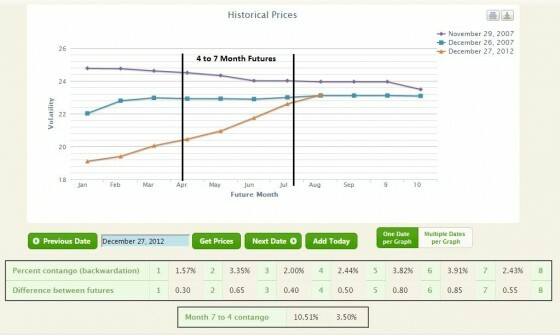 The process sells the last of the 4-month futures the evening before the nearest (1 month) futures expire. Can I invest in mid-term volatility? See Volatility Tickers for the full list of USA volatility related ETPs, their websites, prospectus, etc. For a mid term volatility investment strategy that utilizes the VIX for timing see Taming Inverse Volatility with a Simple Ratio. What does it mean when mid-term volatility futures are in contango? Contango is a futures market term signifying that contracts with more time until expiration are more expensive than shorter-term contracts. In commodities markets (e.g., natural gas) this is the typical state if supply and demand are in balance and the product has carry costs (e.g., storage). When futures markets are in contango it’s expensive to hold (be long) futures because the contracts are decreasing in value over time. Of course if the underlying commodity/index that the future is based on increases enough it will compensate for those losses. How often are mid-term VIX Futures in contango? How do you compute contango on mid-term volatility? The total amount of contango is just the percentage difference between the 7 month and 4th month futures’ price (e.g, (M7-M4)/M4). Divide this result by 3 to get an estimate of how much the value of a medium term position in volatility will decrease in a month due to contango. What happens if medium term VIX futures have a negative slope (longer term contracts cheaper then shorter term)? This situation is called backwardation. It happens when the markets are very fearful. In this case the rolling index will tend to increase in value because the contracts get more valuable as they get closer to expiration. How volatile is medium term volatility compared to short term (1 to 2 months)? Medium term volatility tends to experience about half the volatility of short term. In 2012 the annualized volatility was around 35%, compared to 70% for the short term rolling indexes. Has the general behavior of mid-term VIX futures been stable? For the first 6 years of VIX futures trading (starting in 2004) the mid-term futures term structure tended to be quite flat during quiet times. However, starting in late 2009 the typical structure has shifted to a fairly steep structure, with the 4th month futures trading for significantly less than the longer-dated futures. Recently the slope has been hitting historic highs. The reasons for this shift are not clear, but during that period the VIX Futures market has increased dramatically in open interest and volume. I suspect the current shape better reflects the true costs of that the futures market makers have in hedging these contracts. What are the advantages / disadvantages of investing in mid-term volatility? If you want to be short volatility, the medium term investments are not as scary. An overnight volatility event (e.g., earthquake, terrorist event) will not move the mid-term indexes near as much as the short term. The contango losses in the rolling indexes are lower than the short term indexes, lowering the costs of holding a long volatility position. However the contango losses in medium term volatility have increased to painful levels—often running in the 3 to 5% per month level.